Here’s grip so non-slip you’ll think your feet are roped to the deck. 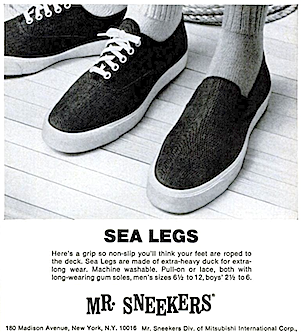 Sea Legs are made of extra-heavy duck for extra-long wear. Machine washable. 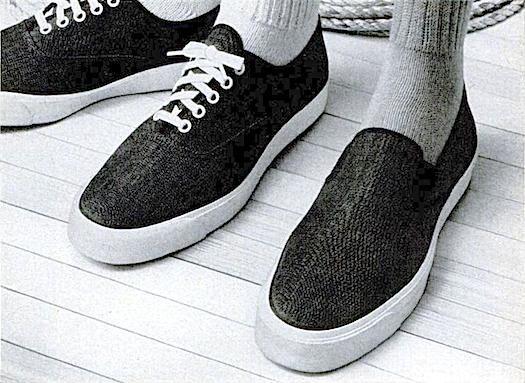 Pull-on or lace, both with long-wearing gum soles, men’s sizes 6 1/2 to 12, boys’ 2 1/2 to 6. 180 Madison Avenue, New York, N.Y. 10016 Mr. Sneekers. Div. 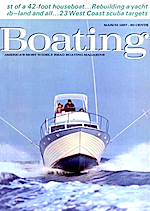 of Mitsubishi International Corp.
converse boating shoes "if our boating shoes and foul weather suits make you the best hand on deck … isn't that what you expected?"